In May 1924, an Air Raid Precautions Committee was set up to investigate how to protect the public from air raids however no progress was made with shelters for many years. In February 1936 a technical Committee on Structural Precautions against Air Attack was created but again there was little progress due to lack of information on which to base design recommendations. During the Munich Crisis, local authorities were encouraged to dig trenches to provide shelter for the public and forty such trenches were dug in Yeovil. 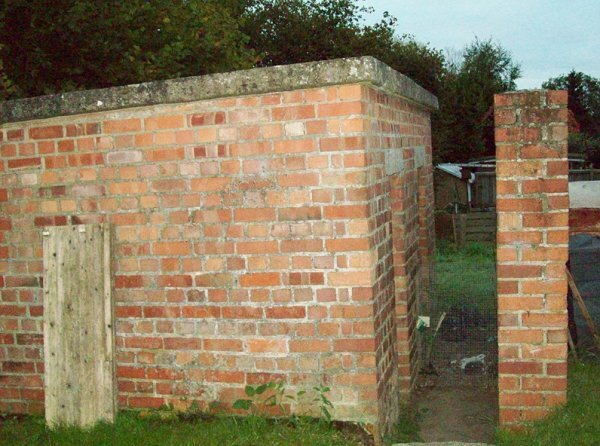 After the crisis, the British Government decided to make these a permanent feature, with a standard design of precast concrete trench lining although it was found that performance was very poor and very few Yeovil trenches were lined. The government decided to issue free to poorer households the Anderson shelter, and to provide steel props to create shelters in suitable basements. Of course people could construct their own shelters and several "one-offs" existed at one time. The photograph at left shows an Anderson shelter under construction at left and at right is a finished shelter banked with earth on top and all sides. The Anderson shelter was designed in 1938 by William Paterson and Oscar Carl Kerrison in response to a request from the Home Office. It was named after Sir John Anderson then Lord Privy Seal who had the responsibility for preparing air-raid precautions. Anderson shelters were designed to accommodate up to six people. Six curved panels of corrugated galvanised steel sheets were bolted together at the top, with three flat panels on either side, and two more flat panels at each end, one with a doorway. A small drainage sump was to be incorporated in the floor to collect water seeping in. The shelters were 6ft (1.8m) high, 4ft 6in (1.4m) wide, and 6ft 6in (2m) long. They were designed to be buried 4ft (1.2m) deep in the soil and then covered with a minimum of 15in (0.4m) of soil over the roof with more at the sides. 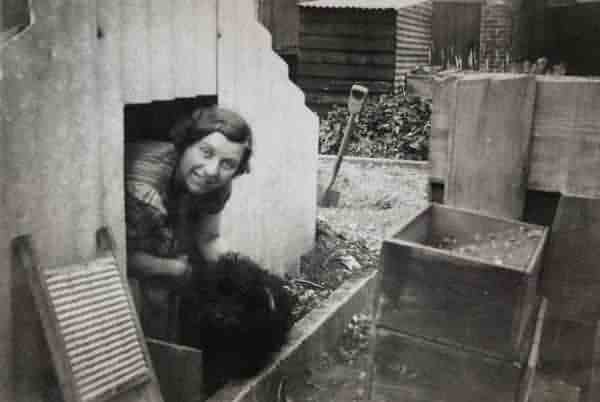 John's Aunt Evelyn peering out of her Anderson shelter, believed to be in Grass Royal. "Everyone used torches in the blackout as the only light we ever saw outside at night was moonlight, so a lot of the time everywhere was black. If we had a long way to walk at night we would shine the torch on the ground several yards in front and as we walked we would switch the torch on and off every five seconds or so, this was supposed to make the battery last longer." Anderson shelters were issued free to all householders who earned less than £5 a week, and those with a higher income were charged £7. Over 3,500,000 were erected nationwide, but just 528 in Yeovil. After the war most were dug up and the council reclaimed the steel sheeting. At present only one or two are known to survive in Yeovil. The Morrison shelter, officially called the "Table (Morrison), Indoor Shelter", was essentially a large steel table with wire mesh enclosing the bottom. Over 3,000 were issued in Yeovil. It was designed by John Baker and named after the Minister of Home Security at the time, Herbert Morrison. 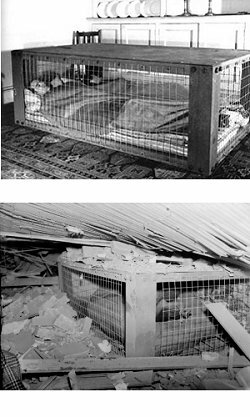 The photographs at left show a Morrison shelter in use and a Morrison shelter that survived an air raid. The shelters came in kit form to be assembled in-situ in the home and contained 359 parts and had 3 tools supplied with the pack. They were about 6ft 6in (2m) long, 4ft (1.2m) wide and 2ft 6in (0.75m) high, with a solid 1/8 in (3 mm) steel plate “table” top, welded wire mesh sides, and a metal lath “mattress”- type floor. The shelter was provided free to households with a combined income of less than £400 a year. 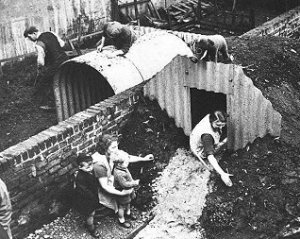 My gran had a Morrison shelter in her house in north London in which she and my aunt sheltered during many air raids on the Royal Small Arms Factory at Enfield Lock. They survived a near miss which brought the ceiling down on them and all they had were minor cuts and scratches from the flying shards of glass created when the windows were blown in. "You hear a lot about Anderson shelters but a lot less about Morrison shelters and they were a far more sensible idea.... and we Boy Scouts were ideally suited to erect these table shelters, as they were just like a large Meccano set. The council would deliver the kit to the address and we would arrive and construct them. Because the shelters were designed to double up as a table as well, it often meant that we had to carry the existing table into another room. The four corner posts (made of half inch angle iron) were the heavy bits and it took two of us lads to carry them into the house. All four were connected, top and bottom, by other pieces of angle iron and the whole looked like a telephone kiosk on its side. The top was a very heavy lump of quarter inch plate, measuring 3’6” by 6’6” and when it was laid on the framework it made a grand table. The bolt heads could be a bit of a problem but the completed shelter looked so robust that no one seemed to mind." 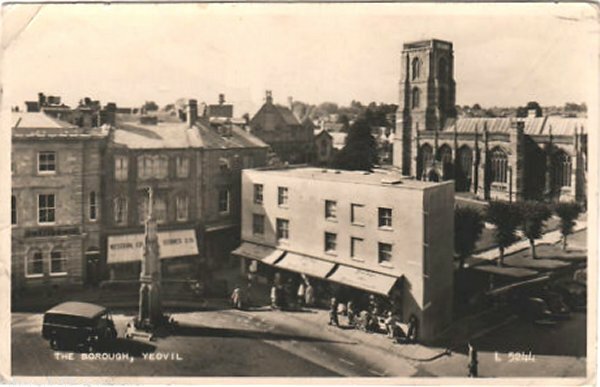 In answer to the threat of aerial bombing of Yeovil, over forty public shelters were created, either public surface shelters or public basement shelters. Surface shelters tended to be brick-built with concrete floors and flat concrete roofs and were strategically located where it was thought the public may be present in numbers. On the other hand basement shelters were usually makeshift conversions of existing basements to shops and the like in the main streets. Some basements were really large, for instance that of the Western County Stores at 10 High Street (next to Lloyds bank in the Borough) was large enough to accommodate 150 people and Hollands House, now offices of Yeovil College, had the chapel in its basement converted to a shelter with the ability to accommodate up to 80 persons and known as Public Basement Shelter P37. A postcard from the early 1950's showing the Western County Stores (with the awning, behind the War Memorial) in the Borough. There again, some public basement shelters were quite small. 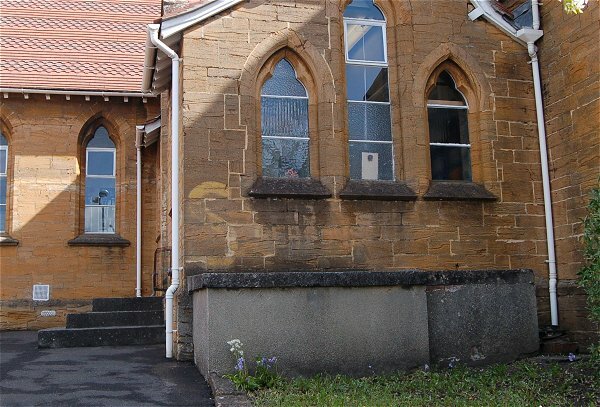 Photographed below is part of the Yeovil Centre facing Reckleford, formerly the old Reckleford Board School, which could accommodate just thirteen people. Still discernible even today, over seventy years since it was painted on the wall is a large yellow 'S' for shelter and '13 persons' written by the side of it which would have notified any passers-by caught out in an air raid of its existence. The grey concrete structure seen in the photo covers the access stairs. Photographed in 2013. "We started to get air raid sirens wailing, and on one occasion whilst making our way to the shelters we saw a ‘dog fight’ in the sky over the Hendford Hill area. One of the planes was spiraling out of control, the pilot baled out and a parachute opened, we all cheered until someone said it was one of ours. We had many warnings but no real action, although we diligently trooped to the air raid shelters each time, this routine got slower and slower. Then one day, things livened up with bangs and guns firing creating a great noise. The Westland factory staff ran as fast as they could to the shelters, even faster that leaving work on a Friday evening!. The shelters were in lines to the west of the Westland factory. A first 'yellow 'alert would permit those who were nervous to go to the shelters. A 'red' alert was optional to go but encouraged. Many got so fed up with the trooping to the shelter when no raid had developed after the warnings that they stayed at work. There was a problem with the night shift though. Even after the 'all clear', the security had to go to the shelters to clear out the couples having clandestine trysts." The Borough Council erected ten public surface shelters, mostly designed with a covered porch access at one end and probably divided into three compartments to hold a total of thirty six people. Their locations are listed in the table below. 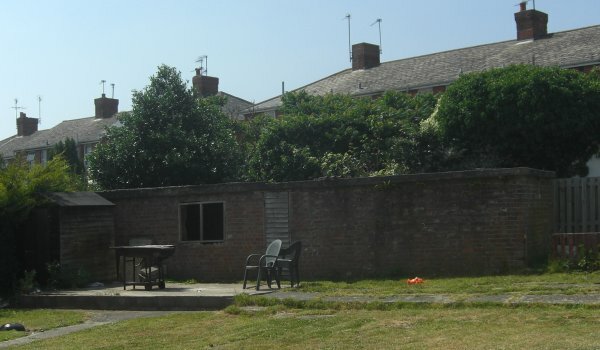 The public surface shelter behind the church of St Andrew in Preston Grove is a typical example of the public surface shelters that were erected across Yeovil. Photographed below, it is built of brickwork 1ft 1¾in (0.35m) thick, with a flat concrete roof. It has two entrances on the southern side at each end, but there are no blast walls protecting the entrances since the north wall of the church is so close. With its entrances at either end now blocked, it would appear that the shelter had three internal compartments. The overall external dimensions are 36ft (11m) long by 13ft 4in (4m) deep and 7ft 6in (2.3m) high. It would probably have been designed to accommodate thirty six people. Photographed in 2013. Schools were a special consideration since there were likely to be high concentrations of children during school hours. Consequently many schools had special air raid shelters. 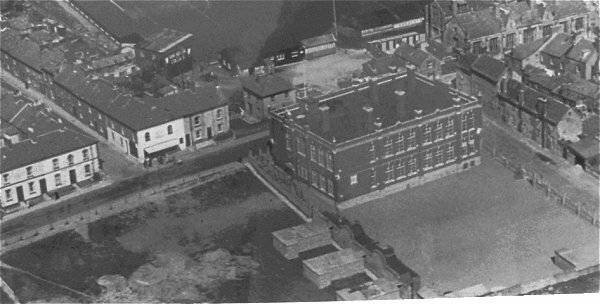 At left is an aerial photograph taken just after the Second World War showing Yeovil School with Mudford Road at left and Goldcroft at right. There a group of three shelters at left adjacent to Mudford Road and another group of three shelters to the right, adjacent to Goldcroft. These were most likely semi-sunken shelters covered with earth for additional protection. 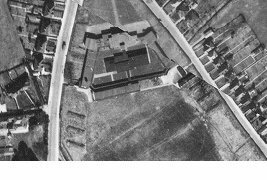 In the Fairfield south of Huish, next to the school, the plan was to have a couple of forty-eight people shelters and one accommodating twenty four - a total of one hundred and twenty. In the event, three equal-sized shelters are seen at bottom centre in this aerial photograph taken in the 1950's. These were probably shelters for thirty six, giving a total of one hundred and eight people. The hazy area in the field at bottom left is where the three Type A4FTR2 Variant surface communal shelters (see below) associated with the military site at the bottom of Fairfield were removed after the war. 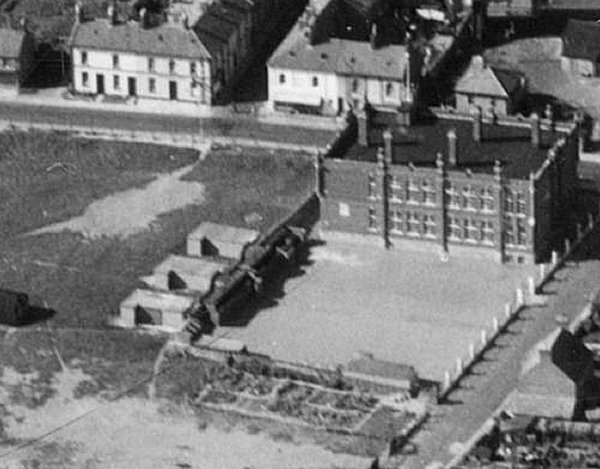 .... and seen from a slightly different angle in this aerial photograph of 1953. 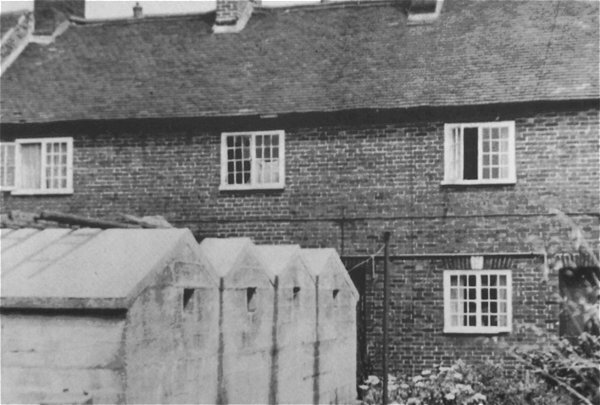 Two air raid shelters survive at Pen Mill infants school, St Michael's Avenue, photographed below. They are both triple chamber shelters with a protective porch to the entrance at each end, with the opening on the south side of the porch facing the school. They are built of red brick with a concrete roof with ventilation bricks below. They are each 30ft (9.1m) long externally. The Pen Mill school shelters - at left is the porch of the eastern shelter which is mirrored in the western shelter at centre. Photographed in 2013. 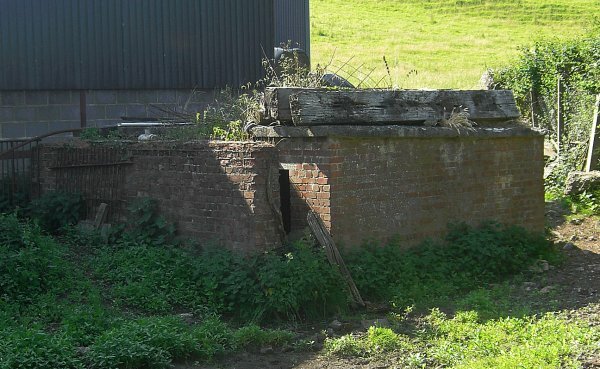 During May 1940 the War Office set up the Directorate of Fortifications and Works, Branch 3 (FW3) under Major-General GBO Taylor whose remit was to design a range of defensive structures - mainly hardened field defences or 'pillboxes' - that would be suitable for construction by the army and/or civilian contractors. 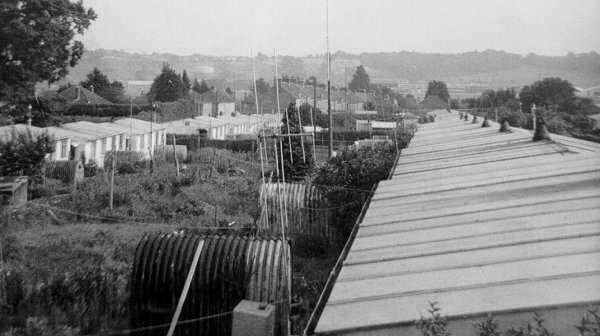 Although I'm not 100% certain, it is more than likely that FW3 designed the following communal surface shelter types as the nomenclature and standardised modular design style are all but identical to other structures I've studied in Somerset, such as the Taunton Stop Line where FW3 is known to have been involved. Well over two hundred communal surface shelters were built across Yeovil usually in the back gardens of houses and shared by groups of neighbours. The shelters were usually divided into two or more compartments so that a direct hit on one compartment would still offer some protection to the occupants of any other adjoining compartment. Each compartment was designed to accommodate twelve persons. 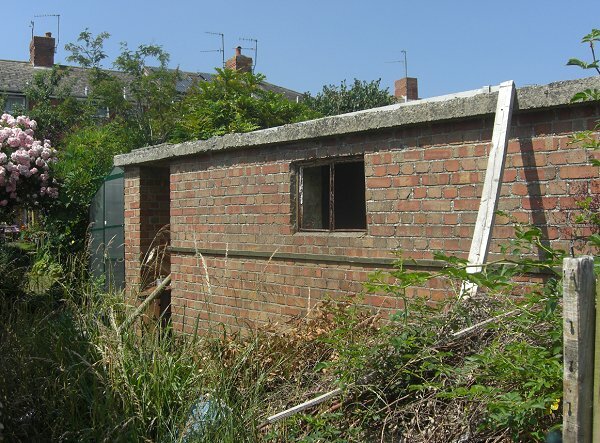 These shelters were almost all built of brickwork one and a half bricks, 1ft 1¾in (0.35m), thick. The brickwork was laid exclusively in English bond (that is, alternating courses of headers and stretchers - one course showing the sides of the bricks, the next course showing the ends of the bricks as seen in all the photographs below) since this is the strongest type of brickwork bond and that best able to stand up to the blast of a bomb. Very occasionally the walls were constructed in concrete blockwork. Roofs were constructed in reinforced concrete, usually flat but sometimes pitched over individual shelter compartments. From the examples seen, the reinforcing rods were almost exclusively ¼in (6mm) steel and tales of any old steel such as bedsteads and old bicycle frames being used to reinforce the concrete are apocryphal. In terms of hardened field defences (the military classification of shelters, etc.) the construction of communal shelters was deemed "bullet proof" and would protect the occupants from anything other than a direct hit. So in theory the occupants would be well protected from strafing by airplane machine guns (which happened more than once in Yeovil) or the more hazardous and common prospect of being hit by one of the thousands of pieces of shrapnel from our own anti-aircraft guns falling back to earth. In practice this was not such a serious problem in Yeovil as in other cities because Yeovil was only protected by light anti-aircraft defences. 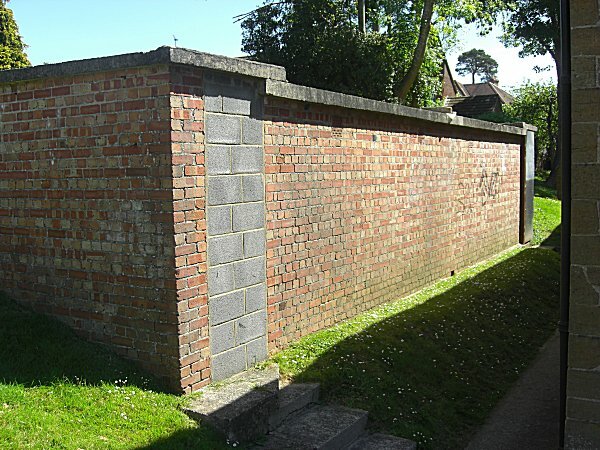 Generally the air raid shelters were built to certain patterns, described below, of brickwork 1ft 1¾in (0.35m) thick with concrete roofs and floors. These shelters were usually built in multiples of between two and four grouped shelters, although a block of eight was built in West Street. Each shelter was generally 10ft 7½in by 4ft 6¾in (3.24m by 1.39m) internally and multiple shelters meant that a direct hit on one might offer some small protection to the occupants of the adjacent shelters. 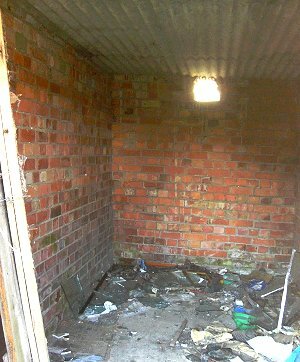 The photograph at left illustrates the interior of a partially demolished air raid shelter. Of course it would have been almost pitch black inside and the 'window' at the end was made by knocking out the air bricks. Note too that re-usable corrugated galvanised sheeting was used as the shuttering of the concrete roof. Joyce, Maxwell and Jimmy Fitkin, who were all killed when a German bomb landed on their air raid shelter in Preston Grove. This was the smallest type of surface communal shelter and consisted of one single compartment, 10ft 7½in by 4ft 6¾in (3.24m by 1.39m) internally. A traverse or blast wall was provided to shelter the entrance. All the walls were of brick construction 1ft 1¾in (0.35m) thick. They had a concrete floor and a flat reinforced concrete roof and in all examples seen the roof carried on across the access and over the blast wall as in the photograph below. These single compartment shelters were designed to accommodate twelve people. Very few of these single shelters were built but certainly a couple still exist in New Town. 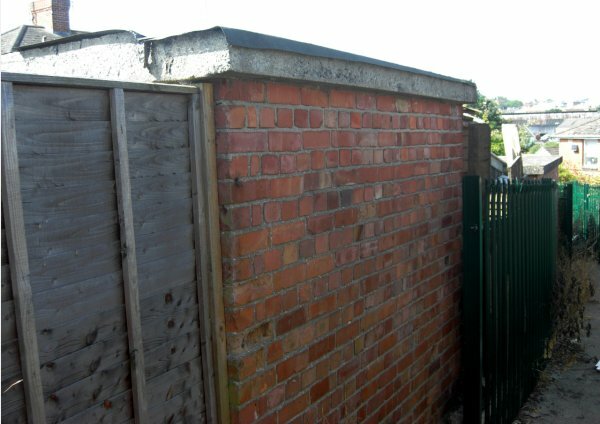 The dimension of this blast wall, just 8ft 3in (2.5m) in width, signifies a single air raid shelter lies beyond the fence. The roof of a double Type 2A1FR1 is just visible above the fence at right. Photographed in 2013. A surface communal shelter consisting of two separate compartments, each of 10ft 7½in by 4ft 6¾in (3.24m by 1.39m). These compartments were built in line sharing a central cross passage with the entrances to the compartments in the cross passage meaning a blast wall was not required. All the walls were of brick construction 1ft 1¾in (0.35m) thick. They had a concrete floor and a flat reinforced concrete roof, which was of slightly different thickness over the cross passage. These double compartment shelters were designed to accommodate twenty four people. Over twenty of these pairs of shelters were built, chiefly in the area between Roping Road, Goldcroft and New Town. Surface Communal Shelter Type 2A1FR1. The window is post-war as is the timber boarding door blocking the access between the two shelters. Photographed in 2013. A surface communal shelter consisting of two separate compartments, each of 10ft 7½in by 4ft 6¾in (3.24m by 1.39m). These compartments were built side by side with both entrances on one side and were protected by a blast wall. All the walls were of brick construction 1ft 1¾in (0.35m) thick. They had a concrete floor and flat reinforced concrete roof. These double compartment shelters were designed to accommodate twenty four people. More than eighty five of these pairs of shelters were constructed across Yeovil. A Type A2FTR1 Surface Communal Shelter. This is the normal type in which the access space between the shelter and the blast wall is not roofed over. Photographed in 2010. A Surface Communal Shelter Type A2FTR1 variant - with the roof extending out to include the front blast wall and protect the entrances from above but giving the appearance that the shelters have a side entrance whereas this is only the entrance to the access to the entrances. The window was inserted post-war. Photographed in 2013. Consisting of two separate compartments, each 10ft 7½in by 4ft 6¾in (3.24m by 1.39m), the compartments were side by side with both entrances on one side. The entrances were protected by a blast wall. 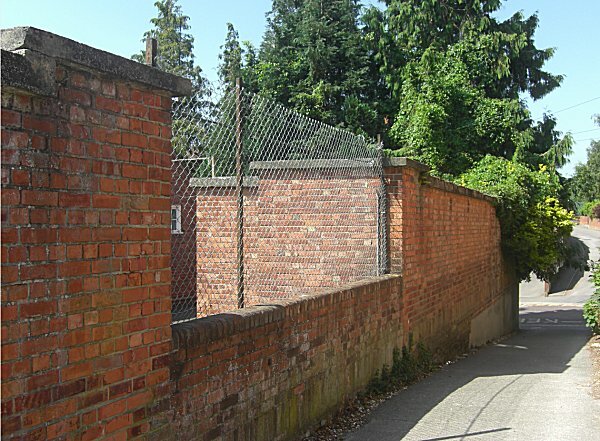 All walls were of brick construction 1ft 1¾in (0.35m) thick. The shelters had a concrete floor and reinforced concrete roof. The roofs were individually pitched over each compartment. These double compartment shelters were designed to accommodate twenty four people. About thirty six of these pairs of shelters were built, chiefly in the area between Preston Grove and West Hendford. A surface communal shelter consisting of three separate compartments, each of 10ft 7½in by 4ft 6¾in (3.24m by 1.39m). The compartments were built side by side with all entrances on one side protected by a traverse or blast wall. All the walls were of brick construction 1ft 1¾in (0.35m) thick. They had a concrete floor and flat reinforced concrete roof. These triple compartment shelters were designed to accommodate thirty six people. Only about a dozen of this type of air raid shelter were built in Yeovil. Surface Communal Shelter Type A3FTR1. Photographed in 2013. This was a surface communal shelter consisting of three separate compartments, each of 10ft 7½in by 4ft 6¾in (3.24m by 1.39m). These compartments were built side by side with all three entrances on one side. These entrances were protected by a traverse or blast wall. All the walls were of brickwork construction 1ft 1¾in (0.35m) thick. They had a concrete floor and reinforced concrete roof, the roof being pitched individually over each compartment. These triple compartment shelters were designed to accommodate thirty six people. Only about half a dozen of this type of shelter was constructed. A surface communal shelter consisting of four separate compartments, each of 10ft 7½in by 4ft 6¾in (3.24m by 1.39m). These compartments were built side by side with all entrances on one side. These entrances were protected by a traverse or blast wall. All the walls were of brickwork construction 1ft 1¾in (0.35m) thick. They had a concrete floor and flat reinforced concrete roof. These quadruple compartment shelters were designed to accommodate forty eight people. I only know of one of this type of air raid shelter constructed in Yeovil. This was a surface communal shelter consisting of four separate compartments, each of 10ft 7½in by 4ft 6¾in (3.24m by 1.39m). These compartments were built side by side with all entrances on one side. These entrances were protected by a traverse or blast wall. All the walls were of brick construction 1ft 1¾in (0.35m) thick. They had a concrete floor and reinforced concrete roof, the roof being pitched individually over each compartment. These quadruple compartment shelters were designed to accommodate forty eight people. Only about sixteen of these blocks of shelters were built in Yeovil. Type A4FTR2 surface communal shelter at Picketty Row, photographed around 1950. These do look like cast concrete rather than brickwork. A surface communal shelter consisting of four separate compartments, each of 12ft 8in by 4ft 6¾in (3.86m by 1.39m). These compartments were built side by side with all entrances on one side protected by a traverse or blast wall. All the walls were of brick construction 1ft 1¾in (0.35m) thick. They had a concrete floor and reinforced concrete roof, the roof being pitched individually over each compartment. Three of these variant shelters are known and being shelters of non standard size were described as sleeping shelters and located next to each other in Fairfield, south of Huish. These three shelters, unique in Yeovil, are most likely associated with the military site immediately to the south. This was a semi sunken communal shelter consisting of four separate compartments, each of 10ft 7½in by 4ft 6¾in (3.24m by 1.39m). These compartments were built side by side with all entrances on one side. These entrances were protected by a traverse or blast wall. All the walls were of brick construction 1ft 1¾in (0.35m) thick. They had a concrete floor and reinforced concrete roof, the roof being pitched individually over each compartment. These quadruple compartment shelters were designed to accommodate forty eight people. Only about four of these semi-sunken shelters were built in Yeovil that I know of, two in Seaton Road and two in Beer Street. 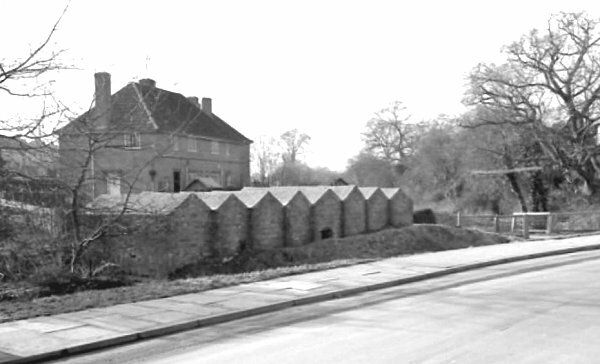 As far as I am aware, unique in Yeovil were these eight conjoined and gabled air raid shelters in West Street, next to the stream. They were brick built and each had a concrete floor and reinforced concrete roof. The roofs were individually pitched over each compartment. The entrance to each shelter was protected by a continuous blast wall which ran the length of the building. This eight compartment shelter was designed to accommodate ninety six people. I remember walking past them many times when I lived locally in the 1970's but they were later removed.